Air sampler ASP-250 is designed to be used with charcoal tubes for personal exposure levels monitoring and working environment measurement. 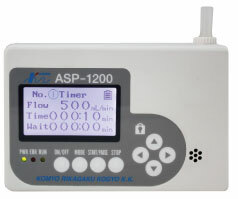 Air sampler ASP-1200 is designed to be used with detector tubes, DNPH tubes and/or charcoal tubes for working environment measurement. Flow visualization is common for air flow check in room and function check of local exhaust ventilation, but heat source is not suitable. The Model AS-1 is designed to check velocity and direction of air flow with an air flow indicator tube (No.301) which reacts with vapour in the air and generates white smoke. Soft case * Air flow indicator tube (No.301) is not included. The Model AS-2 is designed to check velocity and direction of air flow continuously with an air flow indicator tube (No.301) which reacts with vapour in the air and generates white smoke. Have you ever experienced you were uncomfortable when you had to check air flow with an air flow indicator tube where ventilation fan or hood was unreachable or was located at confined space? With a switching operation on the pump, continuous or intermittent air flow check up to 2 metres can be done. 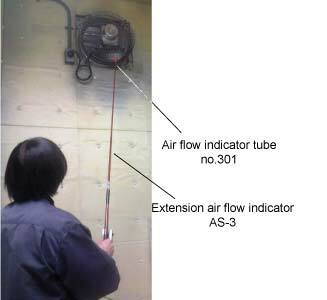 For flow visualization check of air flow at room or local exhaust ventilation. 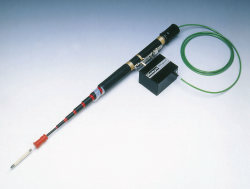 Used with Kitagawa Air Flow Indicator Model AS-1/AS-2/AS-3. Meets OSHA protocol for respirator fit testing. 800B is designed for sampling and measurement of organic solvents in air with personal sampler for industrial hygiene (conformed to NIOSH requirements). Sample air containing vapour of organic solvents is passed through a glass tube packed with charcoal which adsorbs the solvent. Adsorbed solvent is recovered with desorption solvent leeching followed by gaschromatographic analysis. Useful for sampling organic solvent vapours. 801 is designed for sampling organic solvents in environmental air, particularly for polar solvents such as Methanol and Acetone which cannot be sufficiently adsorbed onto charcoal. Organic solvent vapour is adsorbed onto the silica gel while passing through the tube. Adsorbed solvent is recovered with a desorption solvent followed by gaschromatographic analysis. When sample air corresponding to 60 to 80 & of the amount causing breakthrough is passed, the colour begins to change from blue to pink by the moisture from the silica gel side predicting breakthrough. 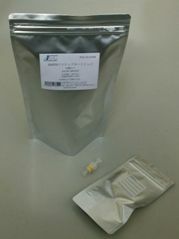 The special sorbent tube contains silica gel crystals treated with 2,4-Dinitrophenylhydrazine(DNPH), designed to collect Formaldehyde, MEK and other Aldehydes and Ketones in indoor and industrial atmospheres. In case of an analysis of normal indoor air, 0.005 to 5ppm Formaldehyde can be analyzed at 6-10L sampling. 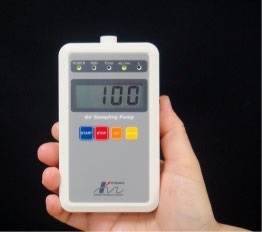 In case of an analysis of normal indoor air, 0.005 to 5ppm Formaldehyde can be analyzed at 1L/min sampling for 10 minutes. Packaged in an aluminum bag. * Click gas name to download the specification of each detector tube (pdf file at 25-40KB). 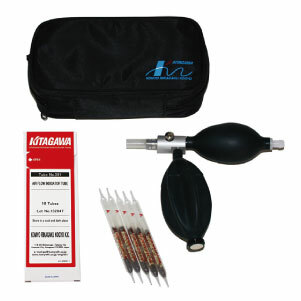 Use gas aspirating pump AP-20 series for these tubes. 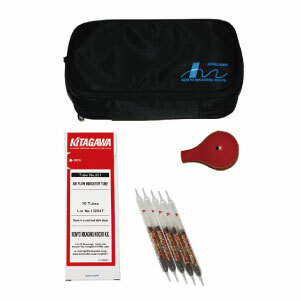 Use an air sampler (ASP-1200) for these tubes.